Blastbeats to stop your heartbeat. Deathbound’s promo sheet says it pretty well, as their brand of furious grindcore can leave the listener exhausted, almost at the brink of a cardiac arrest. This is the Finnish troupes third studio album. They mesh their grind in with considerable amounts of groovy death metal and the “obligatory” punky moments here and there. Drummer Sami Latva, who practises his hard-blasting craft also in fellow grind-masters Rotten Sound, fires away monstrously as Kai Jaakkola spews forth societal venom and hate at speeds equalling rampant bullets. The very first thing that jumps at you from this record is the velar and crispy production. Call me inexperienced, but I have used to hearing my grindcore a bit muddy and filthy along the way, so clarity and balance of this level surprised me. The music has a good balance of riff-based chugging and all-out madness from hell. The group spices it up appropriately with moshable grooves and mid-tempo steamrolling, but too many songs still feel completely devoid of hooks. Yes, it must sound corny for anyone to complain about the lack of hooks in a music based so strongly in grindcore, but I don’t really care about the genre. Music is always better if some catchiness is included, be it with melodies, grabbing rhythmics, cool lyrics, or otherwise. End Of Guessing, Revolutions Against Nothing and Final Element are probably my choices for stand-out tracks. Statisticians might also like to know that this is the second metal album I have heard, which contains the very familiar spoken word dialogue of one Patrick Bateman. 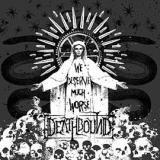 Deathbound could be held as a classic case of a band that has just about the same strengths and weaknesses. It’s superb technical skill is impressive especially in the neck-breackingly fast parts, but the album mostly feels like a sonic mass of brutality, than separate good songs that would form a whole crushing entity. Depending on the listener, this will be a hindrance or an impressive feat that only requires for We Deserve Much Worse to be listened to in a whole sitting. For fans of very well produced grind and extreme metal fans otherwise, this album will probably be a very enjoyable beatdown.